The narrator of Villa Bunker receives letters, dozens of them, sent by his mother from an isolated seaside villa. These letters recount his parents’ troubles in this uninhabitable house, which will soon become a kind of labyrinth haunted by memories and long-buried emotions. At first the narrator’s parents are worried about the villa’s physical deterioration, but soon their own psychological deterioration will become the focus of their tale. Is their madness due to the villa’s aberrant architecture? Is its isolated location to blame? Or were they mad all along? The narrator is left to piece together the clues, in turn falling prey to a villa of his own imagination, which like memory and time is in a state of constant metamorphosis. This piqued my interest, as someone, purely on a level of narrative and story, finds himself remarkably interested in labyrinthine houses. A blurb for the book, from Fabrice Lardreau, calls the book “an unexpected cross between Danielewski’s House of Leaves and Robbe-Grillet’s geometric and obsessional universe in Jealousy.” Between the copy and this blurb, I was convinced I wanted, if not needed to read it. Besides, as someone who is perpetually interested in French fiction, I’m always curious to read more of the contemporary authors that clearly work in a lineage descended from my favorites, like the new-novelists & the post-Tel Quel novelists. Reading the novel, I found myself more than satisfied, though perhaps not in the way I had expected. There is a shifting spatial element to the villa, recorded by the mother in her letters to her absent son, that certainly recalls the inner-narrative of “The Navidson Record” found in Danielewski’s tomb. There is, also, an almost fetishistic level of attention, at time, to minutiae, that certainly recalls Robbe-Grillet. But overall, the extent of these comparisons end at a surface level, leaving the very strange text to move like an abject music score—though not through any formal techniques, but rather through the construction of the narrative itself. The telling of the narrative is perhaps what is most unique about Villa Bunker, shifting between direct quotations from the mother’s letters to, perhaps, a re-telling of the letters by the son himself. The voice shifts invisibly, slides from one to another to the point where in several sections, after getting so caught up in the events transpiring, I had to jump back to figure out how this information was being delivered to me as a reader. This voice-less voice, this technique that evaporates all sense of authority (for the voice is never, really, given over to an omniscient narrator, or if it is it slides away as soon as this begins to peak). The novel becomes a tale of telling, we’re distanced from the fictional events and are forced to consider how it is we are reading. This distance seems to be how Brebel disorients his readers. A straight-forward telling of the tale would succumb to banality. In the interest of disrupting the ennui often brought upon by the telling of a narrative—at least, one should consider, in the current literary atmosphere of France (and by current I’m more aware of what this atmosphere comes after than what it sits as now, dehistoricized). But within this telling, the events that transpire within the house are fantastic. They’re oneiric and creepy, and take place among cavernous and endless series of rooms. An endless amount of interior space seems to me the best location for narratives, or perhaps tableau, that refuse logic, and the architecture of an endless house, a villa on the beach (which already recalls such narrative influences that the head can begin to reel without even reading a word), eating this space and making it present, is the haunted house as expansive instead of claustrophobic. A new atmosphere that deserves its presence. At times, while reading, I encountered the thought that it would be remarkably easy to assume that the events described were some sort of metaphor, perhaps a true allegory, reflecting on the nature of relationships and their own narrative arc as one moves through life growing older. But to reduce the haunted events to pure explanation removes the telling from its power. It becomes old hat, entirely uninteresting. 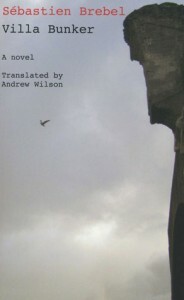 What’s interesting in Brebel’s novel is that the events should not be taken as metaphor, that they’re not hiding some explication of The Human Condition, but rather they’re illustrative of the fact that the world at large is un-knowable to a human being, and that the strange and uncanny nature of reality is all that we have.